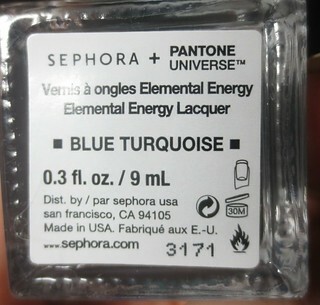 Sephora + Pantone Universe have teamed up again to bring us the new Elemental Energy Collection. This collection is inspired by the four elements (earth, air, wind, and fire), and today I have the Earthy Chrome polish shade to share with you. Sephora + Pantone Universe's Elemental Energy Lacquer in Blue Turquoise* ($12 CAD) appears to be a beautiful purple-green chrome polish in the bottle. When I first saw this polish in the bottle, I was very intrigued! 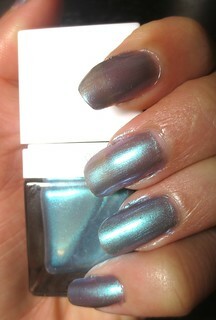 This polish is a beautiful purple-green chrome polish, but unfortunately the formula was fairly thin. I used four coats to get an opaque finish, which was a bit disappointing. 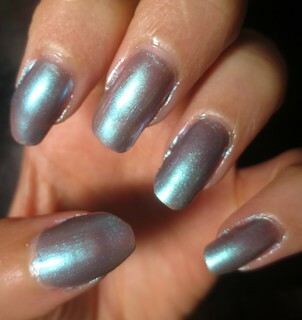 This polish is still really pretty and unique, but I do wish that it was more pigmented. 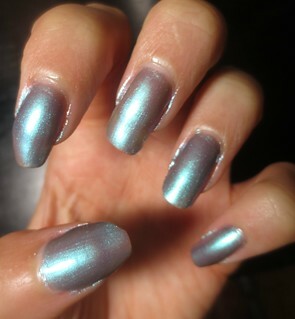 Blue Turquoise has a beautiful duochrome finish to it, which really is quite pretty. This polish dried very quickly, even though I had to use so many coats. I've found that this line of polish is very quick-drying, even though it's not marketed as such. Sephora does suggest that the polishes in this Elemental Energy line are great for layering, so I need to try this out as a duochrome top coat. If you have any suggestions as to which polish to layer Blue Turquoise over, please let me know in a comment! Will you be picking up any of Sephora + Pantone Universe's Elemental Energy Lacquers? I love duochrome makeup because it looks so sophisticated and complex! I really like this color! As for the sheerness, I find that when I layer a white polish under my sheer polishes it makes the color seem brighter and much more pigmented. Quite unique! I've never picked up a Sephora nail polish. I find their nail bar in my area kinda sloppy. this looks much better in the bottle :( I would try layering it over black though, could be pretty! I agree :( I'll have to try that out!